MFA PowerCalf livestock management program is now available through your local Farmers Coop. MFA PowerCalf is a system that helps beef producers maximize the value of herd genetics and overall management. PowerCalf’s data-collection and analysis tools give producers unique insight to help make informed decisions for breeding, feeding and marketing livestock. The result is a clearer path toward profitable and sustainable operations. PowerCalf gives you a more complete picture of your herd and a clearer vision of how management choices will affect it in the future. 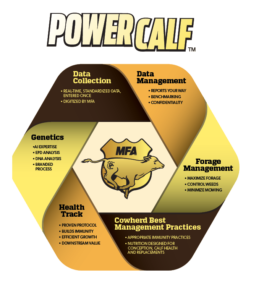 MFA PowerCalf has incorporated everything MFA does into a precision livestock management program. PowerCalf provides goods and services, data collection, data management, forage management, genetics, best management practices for your whole cattle herd, and include the Health Track program under that umbrella. Stop by your local Farmers Coop to learn more about the MFA PowerCalf livestock management tools and find out ways to manage your herd for maximum profits. This entry was posted on Sunday, February 10th, 2019 at 8:04 pm	and is filed under Cattle, News & Updates. You can follow any responses to this entry through the RSS 2.0 feed. Both comments and pings are currently closed.